With most major airlines now charging fees for checked bags and introducing specific luggage restrictions, finding a great carry-on bag has become an absolute must. 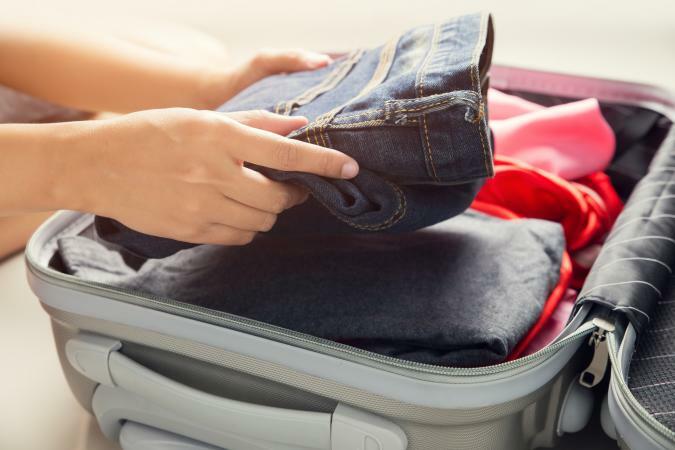 Whether you're a frequent business traveler or someone who only flies occasionally for leisure, consider your packing needs and carrying preferences when determining what type of bag might work best for you. The Rockland Melbourne 20-inch expandable carry-on bag is a popular, stylish, and reasonably priced carry-on. It measures 22" x 9.25" x 22" and features a hard-side polycarbonate outer shell. Available in 21 colors, the Melbourne features 360-degree spinning wheels that make rushing through the airport a breeze. Its lighter weight is a welcome benefit given some carriers are weighing carry-on bags now. This is the number one selling bag on Amazon with nearly 1,600 reviews, over 60% of which are 5 stars. Reviewers love its durability and expandability, allowing them to stuff as much as possible in the bag. Its inexpensive price compared to higher-end bags is definitely a draw, with a number of users claiming they've used this bag extensively for a year or more without any issues. The one downside noted is the red bag has a pink polka dot interior, making it less masculine-looking for male shoppers. Some consumers have complained about the lining tearing in several cases, but as one reviewer noted, she over packed the bag with high heels so it's not the bag's fault that it ripped. Buzzfeed also included this in their round up of the 25 best carry-on bags on Amazon. 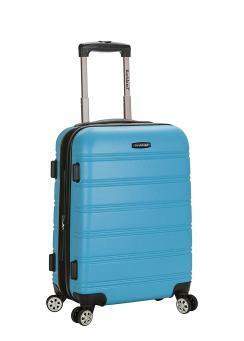 The Rockland Melbourne 20" carry-on is available for order in many colors from Walmart for about $50. 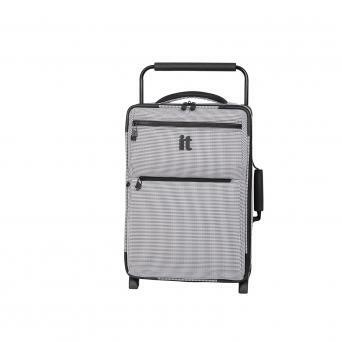 it Luggage's Los Angeles is among the world's lightest-weight carry-on bags. It weighs only 3.63 lbs., making it a wise choice for those who are very concerned about carry-on weight, or those who fly a lot of low-cost carriers that weigh your bags before boarding. This carry-on bag comes in a few different colors, including turquoise, checkered black and white, and navy. Exterior dimensions 21.5" x 13.5" x 9"
Interior dimensions 19.1" x 13.4" x 9"
While it only has a few reviews on Amazon, the Los Angeles by it Luggage is recommended by Smarter Travel as one of the best ultralight rolling carry-on bags under 5 lbs. Their staff has reviewed the bag on at least two separate occasions, two years apart, and swears it's the lightest weight luggage on the market. You can get one with four wheels and more features, but those do add to the overall weight. Buy this bag from Amazon for around $50, depending on color. It is also eligible for Prime shipping. 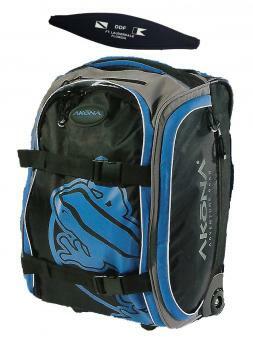 Scuba divers looking for a reliable carry-on bag for their gear should consider the AKONA AKB287. The recently redesigned bag features an 11% increase in capacity and several other new features. It's at the top end for carry-on size at 24" x 14" x 10", so keep that in mind when buying. The durable mini-rip-stop nylon is great for the everyday wear and tear of traveling, which is why this bag is perfect for travelers looking for a reliable carry-on bag to carry scuba gear. Scuba Diving lists a selection of the best travel dive bags as reviewed by ScubaLab. This is one of their recommended picks for lightweight carry-on bags. The reviewers like the rugged material and reinforcements, especially those at the bottom section around the wheels. They note the wheels are set far apart, which makes it more stable whether you're pulling it or it's just standing there. They like how easy it rolled and how quiet it was as compared to the other bags they tested. LeisurePro has the AKONA bag on sale for $99.99, regularly $134.95. Business travelers like the line of Briggs & Riley Baseline Upright bags. The parent company is U.S. Luggage LLC, which has been making cutting edge travel bags for nearly a century. They introduced the first wheeled luggage in 1970 and have been making specialty luggage ever since. The Briggs & Riley brand came into play in the early 1990s, at which time the cutting edge manufacturer started to offer a no-questions-asked lifetime warranty. The "simple as that" warranty even covers damage caused by an airline. The Briggs & Riley Baseline carry-on commuter expandable upright bag made the list of Business Insider's best carry-on bags. In fact, it was their overall pick for the best. Reviewers love its durability, lifetime warranty, and of course, the expansion and compression technology. It's a great bag for travelers who need to fit more clothes in a carry on. The one downside noted is the obvious high price. A bag with this technology and benefits doesn't come cheaply. 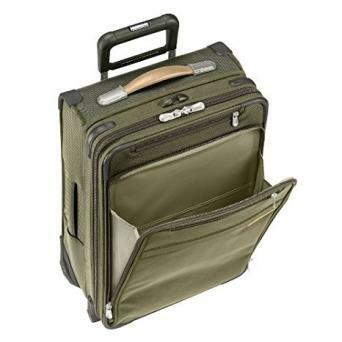 You can purchase any of the expandable carry-on bags directly from Briggs & Riley, with prices starting around $500. TravelPro was started by Northwest Airlines 747 pilot Bob Plath. After flying around the globe thousands of times, he realized that luggage options were not viable for people who traveled extensively. Therefore, Plath decided to start his own company and create luggage that would withstand the heavy travel of those in the flight industry. The 20-inch expandable Business Plus Rollaboard bag has a number of great features that make it a great choice for flight crews and business travelers alike. TravelPro is a trusted brand among frequent travelers and flight crews, so it's no surprise this bag was the readers' choice winner for best carry-on bag for 2017 on Smarter Travel's website. Readers love it for a variety of reasons, including the pockets designed for electronics and the RFID pocket. The one downside is its weight at a heftier 8.2 pounds. 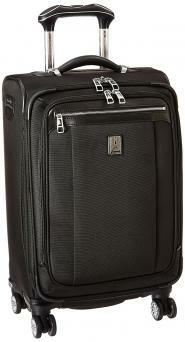 Visit the TravelPro website to buy this bag for $219.99. These represent just a few examples of the many options for carry-on luggage. When making your own selections, consider the type of travel you do, as well as how often you travel. It's also important to think about your preferences in terms of carrying versus wheeling your bag through the airport, and if you'd rather have a bag that you can store under your seat or in an overhead bin. Taking all these factors into consideration can help ensure that you are making the wisest possible purchase decision.